Although Abraham distinguished himself in Bible history as a man of great faith, he was not without fault. Like all believers in the true and living God, he made some mistakes, which he had to repent of, and receive God’s forgiveness. There was one occasion in particular when Abraham failed to trust in Yahovah God’s protection and took matters into his own hands. When his life was endangered, Abraham put his wife Sarah in a position to be sexually defiled by another man in order to save his own skin. The incident occurs in Egypt where Abraham had to take his family to find food (Genesis 12:10-20). At the time, there was a grievous famine in the land of Canaan where Abraham lived, and he was forced to travel to Egypt which had plenty. 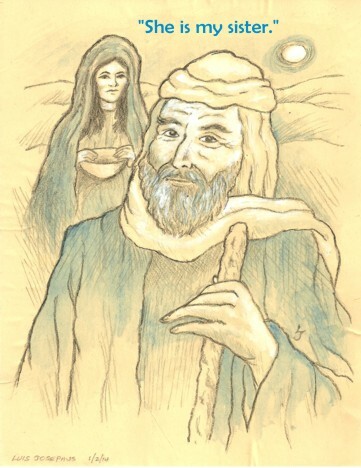 Even at 65 years of age, Sarah was still a beautiful woman and Abraham became fearful that the Egyptians would murder him in order to take his wife (a habit not uncommon in the Middle East). Therefore, Abraham asked Sarah to lie for him and tell the Egyptians she was his sister. Unfortunately, the king of Egypt himself (Pharaoh) took an interest in Sarah’s beauty and brought her into his harem of many wives. But before he could have sexual relations with her, God stepped in to correct Abraham’s mistake. He sent a plague on Pharaoh and his household. When Pharaoh realized what was happening – that he was under a curse, he called for Abraham and confronted him with his deceit. Abraham’s failure to trust God to deliver him out of any trouble and resort to dishonoring his own wife shows us that Abraham’s faith was not yet fully developed; he was still morally weak. However, Abraham did much better as he grew older and wiser in his latter years. As a matter of fact, Abraham became known as the “Father of our faith” because of his overall exemplary accomplishments (Hebrews 11:8-12). We can certainly relate to Abraham, when we examine our own lives. How often have we made mistakes of our own? How many times have we made fools of ourselves for making wrong choices, or failing to trust God as we should? But despite these early setbacks, we can hopefully look back on our own lives and see how much better we are today than yesterday, by the grace of God. How much stronger is our faith today than it used to be, how we have spiritually grown since we first believed. Praise be to God for never giving up on us; His mercies are new every morning (Lam. 3:22-23). Stop punishing yourself for the mistakes of the past, and keep looking forward to the glorious future that God has destined for you. Remember that Jesus our Lord, is the “author” and “finisher” of our faith (Hebrews 12:2). He will never give up on us until He has completed his work in us. It’s not how you start the race that matters most, but how you finish. Categories: The True Israel of God | Tags: Christianity, Deception, Faith, Fear, Forgiveness, Genesis 12:12-20, Grace, Hebrews 11:8-12, Hebrews 12:2, Jesus Christ, Judaism, Lying, Mercy, Messiah, Moral Weakness, Spiritual growth, Trusting, Yahovah God, YHVH | Permalink. Our belief in one God. Abraham, the father of our faith. New Testament believers can gain a deeper understanding of our faith in God and Jesus our Messiah when we study the history of Abraham, the “Father of our faith” (Romans 4:11). Abraham was the man that God personally chose to begin a new nation of people who would willingly separate themselves from the worship of false gods and follow the one true (YHVH) God, Creator of the universe. Yahovah God wants a people that would devote themselves to Him alone, and teach others the same. He is to be the sole object of our love, obedience and worship. In God’s divine purpose to redeem fallen humanity, Abraham became the first person of his generation to know, teach and follow the one true God. As a result of Abraham’s faithfulness, God promised to bless him and his descendants – far above all other people of the earth, and greatly multiply his offspring to become as numerous as the sand in the sea and the stars in heaven. Through him all nations have been blessed that believe (Genesis 17:1-5). Monotheism in the Old Covenant. Abraham’s monotheistic* faith was unique in his day since most of the people around him were pluralistic in their religious beliefs. They worshipped multiple false gods such as Dagon, Baal, Molech, Chemosh, Ishtar, Horus, Isis, Gilgamesh, Marduk, Tammuz, and so on. God taught Abraham to separate himself from all this religious confusion (babel) and superstition, and discontinue the idolatrous practice of bowing down to graven images made of wood and stone, gold and silver. He was also to teach others to worship the one true God in Spirit and truth. The new monotheistic religion that Abraham founded later became known as “Judaism”, and the enlightened people he fathered became known as the “Nation of Israel.” Today, under the New Covenant, all believers in Jesus the Messiah are the true Israel of God, and spiritual sons and daughters of Abraham. 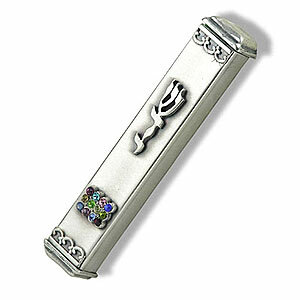 The Mezuzah, traditionally hung on most doorposts which contains the SHEMA prayer. For thousands of years, the holy people of God have recited the SHEMA prayer as a reminder and affirmation of their belief in the one true God. The Shema prayer comes from Deuteronomy 6:4, “Shema Yisrael Adonai Eloheynu Adonai Echad”, meaning, “Hear, O Israel: The LORD [Yahovah] our God, the LORD [Yahovah] is one.” Even today, the Shema is the central prayer in the Jewish prayerbook and is often the first prayer a child learns. Many Jews recite the Shema at least twice daily: once in the morning and once in the evening. The Shema is also written on a small scroll which is then rolled up and put inside a Mezuzah attached to the front doors of many homes. Abraham preaches the one true God. The Jewish historian, Flavius Josephus, relates how God used Abraham to teach many in his day about the importance of monotheism and the worship of the one true God, Yahovah, also referred to as YHVH or Yahweh or Jehovah. It is interesting to note that his own countrymen in Ur of the Chaldeas, where Abraham was born, got so angry at him for preaching the truth about a “one true God” that they chased him out of their land. He probably escaped with his life. If it had not been for God’s protection, he might have been murdered by his own countrymen. These Chaldeans and Babylonians were pantheistic idol worshippers and resented being told they were wrong in their religious beliefs. Many likely refused to give up their worship of multiple gods and became furious with Abraham for pointing out their error. Have you been persecuted for your faith? Has God called you to ‘come out from among them’ and separate yourself from those who are living in religious darkness? Are you being persecuted for refusing to participate in idol worship and pagan practices? Be encouraged by Abraham’s example of courage against the opposition that comes from those who believe not. Remember that all who will live godly in Messiah will suffer persecution. *Monotheism: From the Greek monos, meaning “single”, and theos meaning “god.” Are you worshipping the only one (YHVH) God, Creator of heaven and earth? Categories: Our belief in one God, The True Israel of God | Tags: 2 Corinthians 4:3-4, Abraham, Babylon, Chaldeans, Christ, Commitment to God, Deuteronomy 6:4, Faith, Idolatry, Israel, Jesus, Matthew 5:11-12, Messiah, Monotheism, Obedience, One God, Polytheism, Shema, Yeshua | Permalink.